Connecticut veterans’ leader and decorated soldier Stephen Kennedy has won his eight-year battle to have his Army discharge status upgraded to honorable. Kennedy, of Fairfield, president of the Connecticut branch of Iraq and Afghanistan Veterans of America (IAVA-CT), will continue his federal class action lawsuit on behalf of Army veterans nationwide who received less than honorable discharges for behavior later attributed to Post Traumatic Stress Disorder (PTSD). The Army Discharge Review Board reversed Kennedy’s previous status called “general under honorable,” which deprived him of veterans’ education benefits and the pride and respect connected to an honorable discharge. Kennedy, 31, served in Iraq for 13 months. In the Army, he was given leadership positions, fast-tracked to become a sergeant and honored with several awards including the Combat Infantry Badge, Army Commendation Medal and Army Achievement Medal. His discharge status was based on his going Absent Without Leave (AWOL) for his wedding and honeymoon, a behavior he later said was uncharacteristic for him and based on PTSD, which had resulted from his military service. He had become suicidal and self-destructive, cutting himself and drinking and smoking heavily. 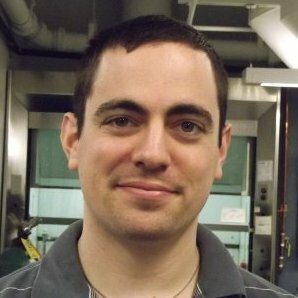 Since he left the Army in 2009, he has received medical help for his PTSD, fathered three children, graduated from the University of Massachusetts, taken a leadership role in veterans’ affairs in Connecticut, and is pursuing a doctoral degree in biophysical chemistry at New York University. He estimated that he lost out on about $90,000 in education grants under the federal GI bill because of his less than honorable discharge status. He said he will now try to be compensated under the GI bill. Kennedy is a lead plaintiff in a lawsuit in U.S. District Court in Bridgeport, which is asking the court to order the Army to properly apply a Pentagon policy that was designed to facilitate discharge upgrades for veterans with PTSD. The policy directs military review boards to give “liberal consideration” to veterans whose service-connected PTSD is diagnosed after discharge. A second plaintiff, Alicia J. Carson, a former Southington resident who now lives in Alaska, was given a status upgrade to honorable by the National Guard in March. The suit was filed last April. 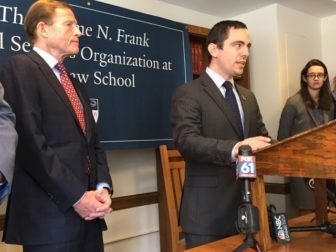 The Yale Law School Veterans Legal Services Clinic is representing the plaintiffs. The clinic estimates that more than 100,000 Iraq and Afghanistan veterans received less than honorable discharges, also known as “bad paper” discharges. The suit is representing those who have discharges labeled as general under honorable and other than honorable (OTH). Stephen Kennedy discusses his military service as U.S. Sen. Richard Blumenthal looks on last April. Kennedy expressed hope that the court will require the discharge review board to handle discharge upgrade cases equitably. He had applied for an upgrade twice, in 2010 and 2015. His second application was denied in a 3-2 vote. He said that the successful application was exactly the same as the previous one, indicating to him an improper process. “We didn’t add anything to what I filed originally and got a completely different result because a judge was watching,” Kennedy said. “To take the exact same case and come to a completely different outcome shows the need for everyone to get a review like this. When no one is watching, they are not doing this properly,” he said. “I really hope that what comes out of this is that everyone gets the same kind of review,” he said. The new federal budget signed into law by President Trump last week includes a provision championed by U.S. Sen. Chris Murphy (D-Conn) for veterans with OTH discharges to receive long-term mental health care from the U.S. Department of Veterans Affairs (VA). IAVA-CT is advocating changes on the state level, which would expand eligibility for state services for service members with OTH discharges and have PTSD, traumatic brain injury, or were victims of military sexual trauma. Such benefits would include state substance abuse treatment, transitional housing, long term care, tuition waivers at state colleges, burial assistance and property tax exemptions. The legislature’s Veterans Affairs Committee has approved the proposal, which needs a vote of the Senate and House to become law.